Porsche has been working on making its line a little greener over the past several years. News reports last year quoted a Porsche official as outlining plans to make hybrid versions of all of its vehicles, though no specific time frame was quoted. Porsche has already begun this process with the Cayenne S Hybrid and, just recently, the Panamera S Hybrid. It has also been thrilling the world with concepts like the 918 Spyder Hybrid, a powerful supercar that it plans to put into limited production. And now it's cut out the gas altogether. Porsche introduced the Boxster E last week, and while the car's still a prototype, it represents the first electric vehicle that Porsche has detailed. Porsche is currently testing three separate prototype versions. Each of the Boxster E prototypes is powered by a 29kWh battery pack and two electric motors worth 241 horsepower. Porsche hasn't gotten into details on the specific placement of the engines or on the performance of the Boxster E models, but has indicated that performance is comparable to the Boxster S, a model that hits 60 mph in 5.3 seconds and tops out at 170 mph. So far, Porsche is just testing the models--Porsche went so far as to call them "mobile laboratories," so we won't necessarily be seeing the Boxster E at auto shows or dealerships anytime in the near future. Porsche CEO Mattias Mueller explained in a press release: "The electrical mobility is a central challenge of the coming years and the engineers at Porsche would like to contribute with the usual excellence of them to be resolved. The Boxster E will help us as mobile laboratories in solving the practical problems of electric vehicles the way that our customers expect." 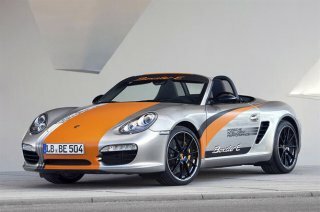 As far as looks, the Boxster E borrows the silver and orange paint scheme of the 918 RSR, a track-focused version of the 918 hybrid concept that Porsche introduced at the Detroit Auto Show last month.